This workshop will concentrate on styling, wiring and carving deadwood to create Jin and Shari. Take one class or both for additional learning time and instruction! 1. Specially priced junipers from The Sea of Junipers which are full of carving opportunities. 2. Yamadori spruce, offered by Mr. Jackel. 3. Furthering a tree from your collection. A special group of Juniper trees with lots of deadwood will be selected from our sea of junipers and available for the workshop. If you cannot attend, you are still invited to take advantage of special pricing on some of Steve’s exciting junipers from the sea! 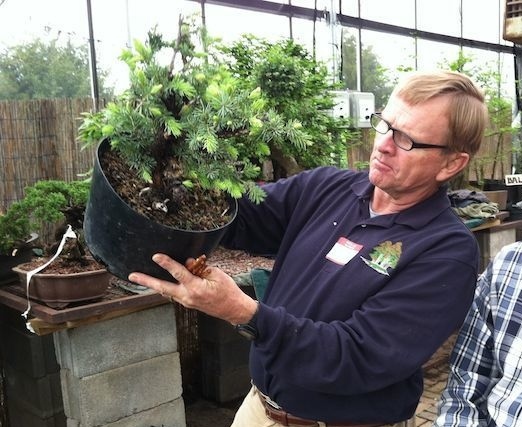 Larry Jackel is an expert collector of trees from nature, the bonsai curator of the Denver arboretum and author of “Ponderosa Pines As Bonsai”. Larry has the unique gift to create believable jin and shari to truly enhance the tree’s character and is an amazing teacher. Reserve your space with a $35.00 deposit by phone or check. You can also Click Here to Reserve Your Class Space. This class is for all levels of bonsai enthusiasts from beginner to experienced, and will expand your knowledge of basic bonsai as well as creating Jin & Shari. This is truly a class not to miss!